Just a post to announce a big Cajun band added to the Gator By The Bay festival for the 2013 festival in May, the Lafayette Rhythm Devils! Straight from Louisiana this is the first time the Lafayette Rhythm Devils have played in southern California and it looks like they will be adding a lot to the festival party! The other big headliners for the Cajun/Zydeco lineup are Geno Delafose, Andre Thierry and Lil Wayne with Same Two Step. 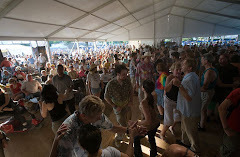 Traditionally the Zydeco dance has not had a lot of overhead type turns but that has changed over the years. Typically swing, jitterbug, salsa and other dances have a great number of turns but over head turns do seem to be increasing in Zydeco. The video clip below with a couple of great dancers, Arthur and Kim, is a good example of how turn are integrated into Zydeco. The difference with Zydeco is the whole dance is based on 8 count patterns opposed to jitterbug with 6 count patterns. For Zydeco dancers who dance swing or other types of dancing it's a little odd to drag out the turns another two beats but it also gives you the opportunity to do a little more with the extra time.